Long before Francis Fukuyama popularized the phrase in the 1990s, the French philosopher and government official, Alexandre Kojève, had come up with his own theory about “the end of history.” Kojève thought that egalitarianism in the French model–an admixture of liberalism and socialism–was the telos to which the ages had been tending, and that further debate among competing political and ideological commitments had become unnecessary. Kojève did not have too much impact in America, but he had a large influence in Europe, and was important in the founding of the European Economic Community, the predecessor of today’s European Union, the current state of which shows, yet again, that one should always view confident statements about history’s end with some caution. We are proud to host an outstanding event on Article 18 UDHR from a truly international perspective. We will be honoured to hear from our keynote speaker, Dr. Ján Figel’, Special Envoy for the promotion of freedom of religion or belief (‘FoRB’) outside the European Union. His perspective on #FoRB is informed by his rich international experience in his current role as well as by his previous experience within the #EU. Dr. Figel’ will be joined by a panel chaired by Mr. Andrew Lewer, Member of the European Parliament and Member of the European Parliament Intergroup on FoRB & Religious Tolerance. Speakers with international perspectives from the United Kingdom and the Commonwealth will include: Mr. David Rutley,Member of the United Kingdom Parliament for Macclesfield and Member of the UK All-Party Parliamentary Group on FoRB (tbc); Mr. Simon McCrossan, barrister and Head of Policy with the United Kingdom Evangelical Alliance; Professor Neville Rochow SC, Government Relations Representative in our EU Office, a barrister from Australia with wide-ranging experience in FoRB in that country prior to joining us here in the EU; Professor Pasquale Annichino, Fellow Robert Schuman Centre for Advanced Studies, European University Institute, and Member of the Italian Council for the relationships with Muslim Communities at the Italian Ministry of Interior. Invitations to actively participate have been extended also to representatives of the European External Action Service and Members of the European Parliament, diplomats and Brussels-based ambassadors from Commonwealth countries. Updates on the program will be posted on our event page. Last week was a momentous one for the European project. On Monday, the Greek Parliament passed an austerity package that other Eurozone members, especially Germany, had demanded as a condition for considering Greece’s request for an €86 bailout. Negotiations will now begin. How they will end is anybody’s guess. No one thinks the austerity package itself will solve the economic crisis Greece faces, and pretty much everyone thinks it will lead to years of misery for the nation. Greece already owes creditors an unsustainable €320 billion. But Germany argues that EU rules prohibit any debt reduction for Greece. Perhaps the parties will find a way to extend Greek payments without calling it a debt reduction. I’m sure the lawyers are working on it. There is plenty of blame to go around. Yes, Greece misled people about the state of its finances when it joined the euro and has spent beyond its means. And the left-wing Syriza government greatly misjudged the mood in Europe and allowed itself to be completely outmaneuvered. But the banks that made the loans should have known Greece was in no position to pay. Having collected their commissions, they passed the debts to national governments–privatized gains and socialized losses–and walked away. As for those national governments, they should have known a common currency without a common fiscal policy was an unworkable proposition. They ignored this truth in pursuit of the illusion of a common Europe, extending from Scandinavia to the Mediterranean and from the Atlantic to the Black Sea. Greece is now paying the price for that illusion. All this has been said before. But I’d like to draw attention to a small element of the austerity package Greece’s creditors demanded, one that has largely escaped notice. Under the terms of the package, in order to stimulate commerce, Greece will have to repeal its restrictions on Sunday store openings. From now on, nationwide, Sunday will be a shopping day. (Two years ago, Athens allowed Sunday shopping in 10 tourist areas, a move that led to protests). Presumably, Greeks will respond by buying and selling and generally growing their economy. The increased tax revenues will allow Greece to pay some of its debt. And repeal of anti-liberal Sunday closing laws will allow Greece to create a rational European economy, like Germany’s—though, ironically, German stores are closed Sundays. We Americans are likely to view this matter as trivial. In America, as Robert Louis Wilken once wrote, the only thing that distinguishes Sunday from other days of the week is that the malls open a little later. Besides, a country can’t be pre-modern forever. Sunday closing laws are hopelessly old-fashioned and illiberal. If Greeks want to stay home on Sundays, they can; but people should be able to shop if they want to. Resistance probably comes from interest groups that oppose free competition. But Greece isn’t America or Germany, or at least it didn’t want to be, and the reform is indicative of a larger issue. The Sunday closing laws reflected the fact that Greece had values in addition to the market. Greece has had a tradition of Sunday closings to allow people to spend time with family and attend church. (Sure, lots of people watch football instead, but that’s a different matter. Hypocrisy is the tribute vice pays to virtue). The ban on Sunday trading acknowledged that Greece is an Orthodox Christian country, with its own rhythms and ways of life. No matter. In Europe today, if it’s a choice between religious and cultural traditions, on the one hand, and commerce, on the other, commerce wins. That’s the economically sound choice. I don’t suppose there’s anything to be done. Greece is in a terrible situation and needs to find a way out. And I know it’s a small matter, compared to the other hardships Greeks will have to bear. But something important is being lost. To be part of the European project, apparently, a country must do whatever it can to become a secular, consumerist, market-oriented place—Sundays included. Localized cultures that stand in the way of economic rationality must recede. Perhaps that’s the inevitable logic of modernity. But it’s not an image the Christian Democratic founders of Europe like Konrad Adenauer and Robert Schuman would have recognized. The European Union and the Catholic Church is the first comprehensive monograph to explore the political relations between the Catholic Church and the European Union. Building on the insights of political theology, it connects the analysis of the political interactions of these two institutions with their broader normative outlooks and the analysis of their ideational orders. This study contains both a concise overview of the historical evolution of the relationship and analysis of the politico-theological strategies the two institutions employ in their interactions, which range from mutual legitimisation to direct normative conflict. This book will be of significant interest to those who wish to familiarise themselves with the Catholic approach to the integration process and to those who are interested in the interactions of the European Union with religious organisations in general, and the Catholic Church in particular. In recent years the European Union has begun to explicitly affirm a foreign policy role for freedom of religion or belief (FoRB). The initial reaction to this trend among many scholars and policy analysts has largely been that of caution—if not outright skepticism—regarding the practical import of the changes. However there are signs of continuing momentum. While the EU’s record thus far does not yet reflect a fully comprehensive strategy for integrating FoRB into its broader agenda for promoting deep democracy, it has been able to enlarge the role of FoRB in its external action on a step-by-step basis. Next month, Oxford University Press will publish Religion and the Public Order of the European Union by Ronan McCrea (University College London). The publisher’s description follows. 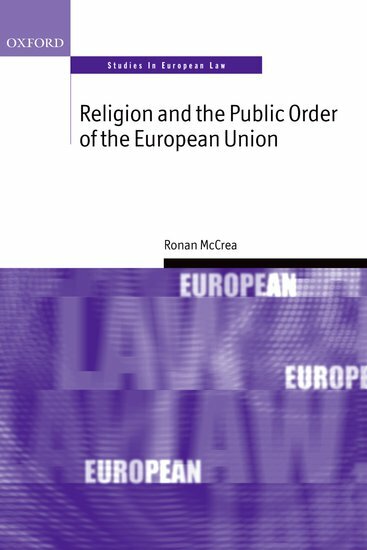 Ronan McCrea offers the first comprehensive account of the role of religion within the public order of the European Union. He examines the facilitation and protection of individual and institutional religious freedom in EU law and the means through which the Union facilitates religious input and influence over law. Identifying the limitations on religious influence over law and politics that have been required by the Union, it demonstrates how such limitations have been identified as fundamental elements of the public order and prerequisites EU membership. The Union seeks to balance its predominantly Christian religious heritage with an equally strong secular and humanist by facilitating religion as a form of cultural identity while simultaneously limiting its political influence. Such balancing takes place in the context of the Union’s limited legitimacy and its commitment to respect for Member State cultural autonomy. Deference towards the cultural role of religion at Member State level enables culturally-entrenched religions to exercise a greater degree of influence within the Union’s public order than “outsider” faiths that lack a comparable cultural role. Placing the Union’s approach to religion in the context of broader historical and sociological trends around religion in Europe and of contemporary debates around secularism, equal treatment, and the role of Islam in Europe, McCrea sheds light on the interaction between religion and EU law in the face of a shifting religious demographic. The article discusses the current status of policy towards religion as a national competence within the framework of European law. It submits on the one hand that, in the present stage of European integration, core decisions concerning the public dealing with religion and religious communities are inherently a national policy domain. However, because religion is at the same time an element of the Member States’ national identities, one of the sources of the founding values of the European Union and a fundamental freedom both nationally, internationally and within EU law, the scope of such inalienable policy domain is shaped, through an on-going process, not only by national law implementing national policy choices on religion, but also by EU law aimed at preserving national identities and the identity and specific contribution of religious (and philosophical and non-confessional organizations) associations, as they have historically and culturally developed within the national States, while at the same time safeguarding the EU framework on fundamental freedoms and fundamental rights; and, finally, by international rules on freedom of religion limiting Member States’ and the EU’s freedom in the same area. As Walter Russell Mead notes, the recent falling-out between Germany and Turkey over Turkey’s accession to the EU confirms what Samuel Huntington wrote in the 1990s: Deep civilizational divides continue to exist and are impossible to ignore. Notwithstanding Kemalist dreams of transformation, Muslim-majority Turkey and liberal, secularist Europe represent different ways of being. It was never clear how the two could successfully merge in one political entity. Under Erdogan’s AKP, the marriage seems further away than ever. Examining the on-going dilemma of the management of diversity in Turkey from a historical and legal perspective, this book argues that the state’s failure to accommodate ethno-religious diversity is attributable to the founding philosophy of Turkish nationalism and its heavy penetration into the socio-political and legal fibre of the country. It examines the articulation and influence of the founding principle in law and in the higher courts’ jurisprudence in relation to the concepts of nation, citizenship, and minorities. In so doing, it adopts a sceptical approach to the claim that Turkey has a civic nationalist state, not least on the grounds that the legal system is generously littered by references to the Turkish ethnie and to Sunni Islam. Also arguing that the nationalist stance of the Turkish state and legal system has created a legal discourse which is at odds with the justification of minority protection given in international law, this book demonstrates that a reconstruction of the founding philosophy of the state and the legal system is necessary, without which any solution to the dilemmas of managing diversity would be inadequate. Adopting an interdisciplinary approach, this timely book will interest those engaged in the fields of Middle Eastern, Islamic, Ottoman and Turkish studies, as well as those working on human rights and international law and nationalism. As I’ve discussed here, recent case law seems to be slowly developing the meaning of the limitations clause beyond the limit on individual free exercise that it originally was by focusing on the type of democratic society envisioned by the Convention. An indicator of that development is the ECtHR’s emphasis on pluralism in the sense of allowing citizens of all faiths as well as nonreligious citizens to flourish in a democratic society. And that leads to a limit to religious identification imposed on the state itself, as opposed to limit on the individual’s free exercise. In short, the clause might become a limit on the state’s identification with religion. This is where we ask the attribution question. And in a system without a distinction between free exercise and nonestablishment, the interesting point to me is that we’re now starting to ask this question in the first place.